Ollies Mower Service was established over 40 years ago by Kingaroy local, Ron Oliver, who built a reputation in the area for quality, down-to-earth service with a local touch that you can rely on. Since taking over the business in January 2013, husband and wife team, Brett and Jacqui Irwin have continued with the same spirit and energy that the Oliver family put into the business for so many years. Brett and Jacqui both have extensive experience in business both locally and internationally and have put their broad experiences to use in keeping the Ollies Mower Service’ legacy alive. We’re a relatively large, yet locally-minded team of passionate professionals looking to get the most for our customers. Tailored advice is given to all our customers based on their needs and budget, and we pride ourselves on continued customer satisfaction via our handy in-house team of small engine mechanics. We’re completely independent; you’ll notice that we supply different brands for different types of product, because we only sell the best. We offer delivery with full oil and fuel, as well as interest-free financing on select models. 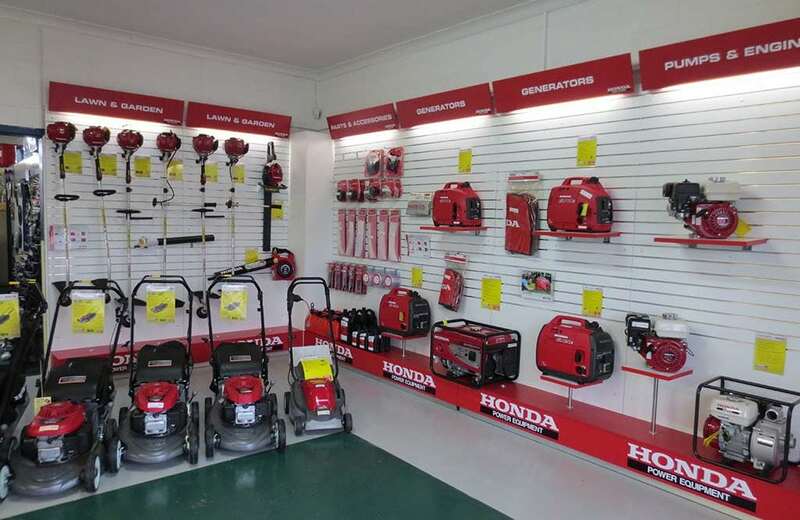 Please give us a call on 0419 621 038 or visit our showroom to see our products in person and get a product demonstration from one of our friendly staff. We love selling the Cox line of products as they’re Aussie built and have a steady reputation for quality products designed to hold up to rough conditions. That said, we’ve got product offerings to suit any budget and application. We truly are a one-stop shop for everything gardening and mowing. Generators and pumps we sell include solar backup generators, generators for caravanning and fishing, as well as pump motors to suit any application, be it dam-sourcing or pool cleaning. Our generators and pumps are designed for heavy-duty usage in rough environments, with some models, like those from Honda even coming with 4-year warranties. We sell both ATVs (all-terrain vehicles) and UTVs (utility terrain vehicles) from Cfmoto, Kymco and Landboss, and have options available to suit any lifestyle within most budgets. Whether you’re a hobby farmer or an experienced professional looking to replace your current equipment, we’ve got an expert team on hand ready to provide you with tailored advice to suit your needs. Our team includes 3 experienced small engine mechanics, ensuring we can get through scheduled servicing quickly and complete emergency repairs in a hurry. Pickup and delivery services are available on request. We stock a range of spare parts to suit every brand that we sell, as well as a bunch of general parts for regular servicing on older equipment you might have. Accessories are also available, including things like ear and eye protection for garden maintenance.